I am quite new to jewelry making, so I am curious if anyone has any feedback! Is it too kiddy looking? This is a very sweet necklace. Pretty and fun! Great job! It most definitely is not kiddy looking, its fab. I am also new to jewellery making. Good luck as you create more beautiful jewellery. Be proud of this its gorgeous. I like the combination of colors, how the green plays off the turquoise. It doesn't look at all childish - It has a beach feel - Hippie vibe - but looks like it took time and care to make. Great job! 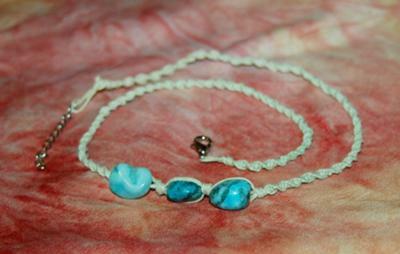 Hi Layla, I am new to jewelry making as well. This piece is pretty, not at all childish. The work you did on it looks well done. Good job. I would definitely wear this. Can you share where you found the pattern or is it something you put together yourself? Thanks for sharing. I don't think it is kiddy looking. I would have put the biggest beads near the center and then added them as they got smaller. But I would wear it!